Years playing with a band and experiencing banding cause me to write for the uninitiated. Those who already band (verb) together may, or may not, recognise what goes on. A brass band consists of ‘brass’ instruments, but does not include trumpets or french horns. It comprises: cornets in the soprano register; English horns in the alto; baritones, euphoniums and trombones in the tenor range, basses in the depths. The cornets and the basses may come in more than one form, Eb and Bb. To all this would normally be added a percussion section. Most players will read music transposed for their instrument so that the natural key of the instrument, Bb or Eb, is read as in C on the stave. That said, the Bass Trombone is often expected to read concert bass clef, and the Eb bass players can probably transpose that with no apparent difficulty. Each player has their own (different notes) part, so two players in a section would be 1st and 2nd, or if three or four in a section, 1st to 3rd or Solo, 1st, 2nd, 3rd. A large cornet section might have Solo or Principal, making four 1st cornets of a high standard and, often sat behind them also on the left of the conductor, two each of 2nd and 3rd cornets, perhaps with the soprano and flugel¹. Few players ‘share a stand’; probably some of the cornets do to make up for lesser volume of sound. The rules for banding state or imply that bands come from very localised areas, ‘within 4 miles of the band room’ for example; this makes for highly localised institutions in the same way that soccer clubs used to. In the early 1900s there were perhaps 20,000 players in the UK, mostly works bands. Funnily enough, ‘brass’ is potentially misleading as many bands play silver-coated instruments and the brass tarnishes so quickly that most instruments are painted with lacquer to delay the oxidation. New techniques now allow for other materials and I predict instruments made in plastic, carbon fibre, and made by 3-D printing very soon. Instruments in a ‘good’ band are not cheap; a good tuba (bass) might cost the same as a small car - and not fit inside it. Been there. This mix of instruments is amazingly flexible and the range of the music is very wide indeed, from reproductions of classical pieces to those from jazz and pop, including heavy metal. There is a large corpus of ‘brass band music’ and those who like the style think bands should play little else. Bands historically compete; the first such event was in 1853. Modern banding has sections much as soccer has leagues; Championship, 1st to 4th, and competitive activity at local, regional and national level. Some bands do not compete, some bands compete only occasionally and some bands apparently exist only to compete. 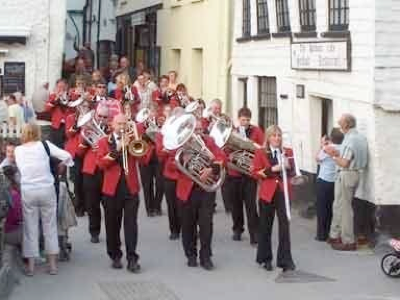 A band gives to the life of the community, playing at fêtes, carnivals, weddings, in church, in the village hall, on the village green and on the march. Marching bands are not as those in the US, where the marching skill itself is high; brass bands in the UK are comparatively staid. At the high levels the standard of player skill is extreme: I came across a band whose first rule of membership was simple: ‘The band comes first’. Before your wife, your job and any life at all. Enough said? The 1996 film ‘Brassed Off’, does well to convey attitudes and dedication but in many ways fails to convey the variety of music that such bands would play. The music for competitions is often specially commissioned and you might attempt to listen to the championship section playing at the national or international competitions. Sometimes it is hard to believe that this is brass and harder still that this is amateur playing. But if the band comes first above all, the meaning of ‘amateur’ needs re-considering. Brass bands should not be confused with military bands, which have a woodwind section - flutes, oboe, clarinets, saxophones, bassoon. Military bands will use French horns not English ones and percussion may switch instruments between marching (side drums) and concert (timpani and drum kit). Bands you can easily listen to would include Grimethorpe, Black Dyke, Willebroek, Cory, Fairey, Leyland. I could and should write a deal more on this. Top pic is St Breward at Port Isaac, Cornwall on a Thursday night in the summer, possibly 1999. Front left trombone player may be recognised. 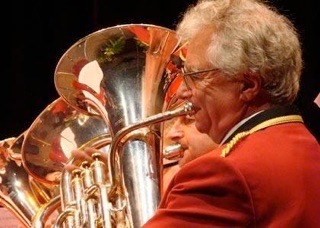 This is Geoff Swann, solo euph(onium) for St Breward, around 2000. 1 A band of 24 might well include 8 cornets, 3 horns 2 baritones and 2 euphs, 3 trombones, 4 basses and 2 percussionists. The eight cornet players would probably include a soprano Eb and a flugel horn, the basses probably two Eb and 2 Bb. A bigger band would usually add more at top first. Trombones are understood to be slide trombones. 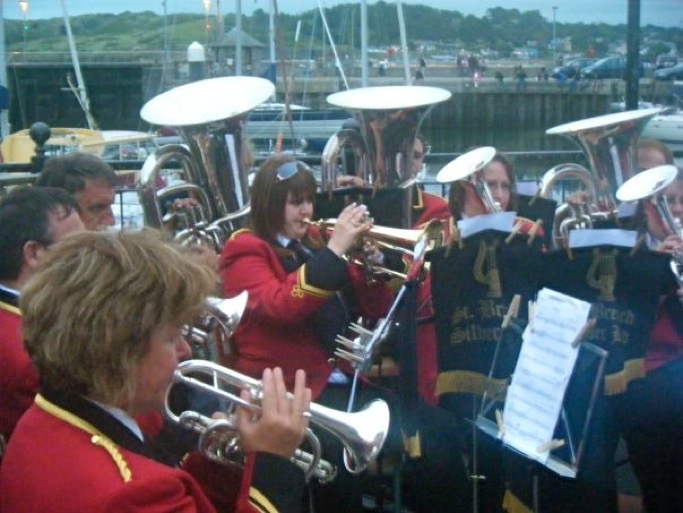 Right shows cornets in foreground, a brass flugel and two English horns, with two sizes of tuba behind. Again St Breward, this at Padstow, probably 2007. Canadian Brass is a small group, two trumpets, horn, trombone and tuba that plays a similarly wide range of music. This is not a brass band in the sense used here but they do display the range of the instruments. their CDs are well worth buying. For something radically different, look up Mnozil Brass. Brass as entertainment doesn’t get much better.